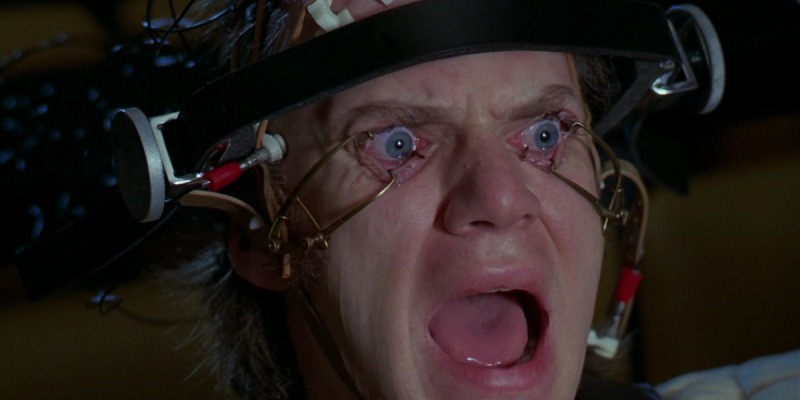 Of the twelve films on my Blind Spot list this year, A Clockwork Orange is the one I’ve received the most stick for not having watched before, but it’s also the one I thought I’d enjoy the least, or at least possibly second to Suspiria. 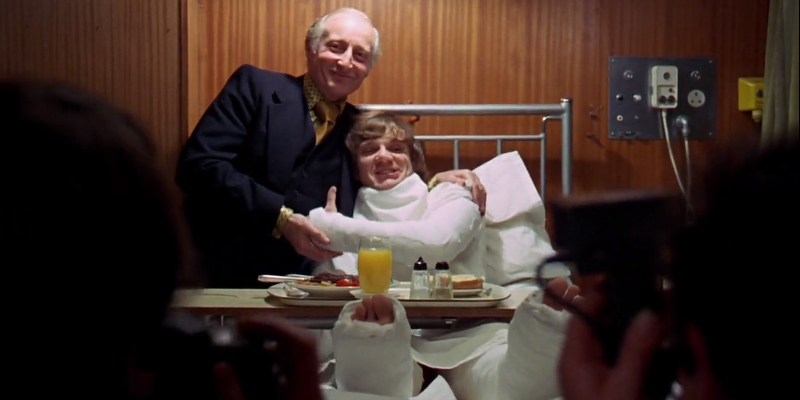 To say A Clockwork Orange has a reputation is something of an understatement, as elements of the entire film are legendary for the harsh atrocities they depict. In fact, when the 1001 Movies list was first published in 2003, it would only have been possible to view this film in the UK for 4 years, as Stanley Kubrick himself requested it be pulled from distribution due to the threatening letters he and his family received. I find it very understandable for why people would have an issue with this film, as there were a few scenes that I found uncomfortable to watch. A colleague of mine who is somewhat older and more conservative in her views apparently once sat down to watch it, knowing nothing of the subject matter other than it being a highly regarded film, and unsurprisingly bailed very quickly on the viewing, deeming it to be filth. So what did I think? Well, to begin with I was very much in agreement with my aforementioned colleague. The opening segment – and it’s likely that this review will contain spoilers – is often unpleasant to sit through, watching Alex and his crew commit horrific acts on undeserving and random targets, and often in long, unflinching takes. What somehow makes it worse is that Alex and his droogs are not the only ones acting in this way, it’s clear there are several, if not many, other such groups performing similar acts. Story-wise they are all necessary though, as we must understand where Alex begins and what kind of a person he is for the rest of the film to have any impact. McDowell is nothing short of incredible in every stage of Alex’s development. He’s perfect for the role right from that very first shot, face pointed slightly down but eyes looking directly ahead, straight down the camera, with his right eye framed with thick, dark, stick-on lashes. Similarly with my recent Donald Sutherland revelation, McDowell has mastered the art of the evil grin. His is mischievous yet more than a little demonic, always unpredictable and often utterly terrifying. 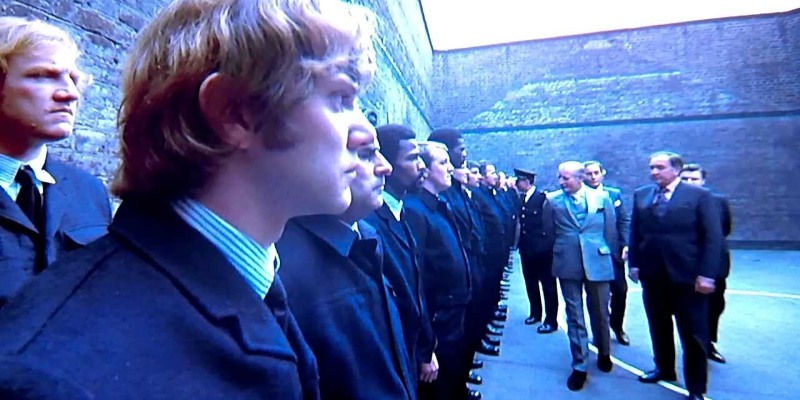 The rest of the cast around him is good, often entertainingly over the top, particularly with the likes of his flamboyant probation officer Mr. Deltoid (Aubrey Morris) and rigid-as-a-truncheon chief prison guard (Michael Bates). It’s McDowell’s show all the way through though, and that’s fine by me. 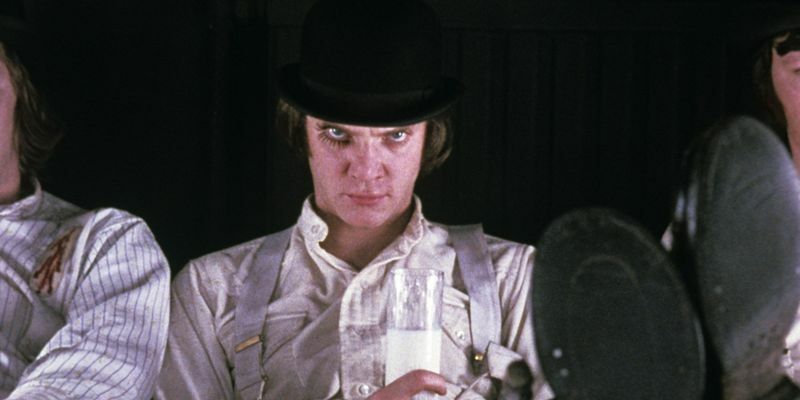 One of the most interesting aspects of the film is the dialect, with the droogs primarily using an unusual hodge-podge of traditional modern English with elements of cockney rhyming slang, colloquialisms and terms presumably of their own creation. Sexual acts are “the old in-out-in-out”, a headache is a “pain in the gulliver,” that sort of thing. It’s fairly decipherable, but the occasional remark was lost to me, which is something I’m positive is benefited by multiple viewings. Aside from the depiction of some of the acts, my only other issue with the film came in its symmetry between the first and last acts, and even then it’s something I can understand being required thematically, but which seemed at odds in terms of plausibility. Pretty much everyone that Alex interacts with in the first segment he then meets again at the end, but never through planning, always out of the sheer random and karmic nature of the world. The drunk and the police I can accept, but arriving at exactly the same house by sheer chance stretched things somewhat. Had there been some intention from the police officers to drop Alex in the vicinity on purpose then I’d be more accepting. Also I wasn’t a fan of the overall ending, the very climax for Alex’s character, but that’s entirely personal taste and won’t be held against the film. I also found the scenes of Alex’s treatment, with the clamps over his eyes, almost painful to watch, but again that’s more my problem, as I’m not a fan of eye trauma on screen. It’d be like my partner disliking the film (and she absolutely would) and blaming it all on the scene where Alex keeps a snake in a drawer. I know I say this a lot, but I don’t think there’s much chance of me going back to this film unless required to for some external purpose. I can understand that there’s a great deal to appreciate, particularly in the performances, direction and cinematography, with many of the visuals being laid out exquisitely, but it’s not a world I find myself drawn to revisit all that often. Still a must-watch though. This entry was posted in 08/10, 1001, 5-Star 500, Blind Spot, Choose Film, Empire Top 301, Empire Top 500, Film-Makers, Review, Stanley Kubrick, TF 100, The List and tagged A Clockwork Orange, Adrienne Corri, Aubrey Morris, Clive Francis, David Prowse, James Marcus, Malcolm McDowell, Michael Bates, Patrick Magee, Stanley Kubrick, Steven Berkoff, Warren Clarke by jaycluitt. Bookmark the permalink. The novel is an interesting read as well. The nadsat dialect is much more prominent, but a lot of the fun I had was trying to figure the meanings from the context. On repeat readings, I have consulted a glossary, but it’s like cheating on a game the first time through. There is also an additional chapter that might prove more satisfying of a conclusion for you. I would absolutely recommend the book. And Suspiria’s pretty great too. Can’t wait to hear what you think! Thanks! I’ll add the book to my list, thanks for the recommendation. I’m not normally a fan of books written outside of traditional English (I hated The Color Purple and recently struggled with Captains Courageous) but I’ll give this one a go. It’s an interesting film, to be sure. Unpleasant, yet somehow one of Kubrick’s more entertaining films (Certainly more than 2001). Great post, and thanks for accepting me into the LAMB! Thanks, and you’re welcome! Welcome to the flock!